Bellevue Literary Press, 9781942658283, 128pp. Does a tear shed while chopping onions look different from a tear of happiness? 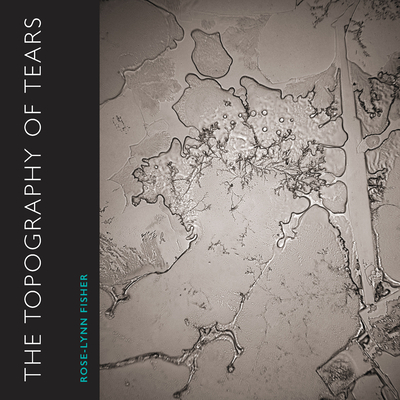 In this powerful collection of images, an award-winning photographer trains her optical microscope and camera on her own tears and those of men, women, and children, released in moments of grief, pain, gratitude, and joy, and captured upon glass slides. These duotone photographs reveal the beauty of recurring patterns in nature and present evocative, crystalline imagery for contemplation. Underscored by poetic captions, they translate the mysterious act of crying into an atlas mapping the structure and magnificence of our interior lives. Rose-Lynn Fisher is an artist and author of the International Photography Award-winning studies Bee and The Topography of Tears. Her photographs are exhibited in galleries, festivals, and museums across the world and have been featured by the Dr. Oz Show, NPR, Smithsonian, Harper's, New Yorker, Time, Wired, Reader's Digest, Discover, Brain Pickings, and elsewhere. She received her BFA from Otis Art Institute and lives in Los Angeles. Rose-Lynn Fisher is an artist and author of the International Photography Award-winning studies Bee and The Topography of Tears. Her photographs are exhibited in galleries, festivals, and museums across the world, including the Palais de Tokyo in Paris, Museum of Science Boston, Johnson Museum of Art at Cornell University, Nova Scotia Museum of Natural History, and Craig Krull Gallery, Santa Monica. They have also been featured by the Dr. Oz Show, NPR, Smithsonian, Harper's, New Yorker, Time, Wired, Reader's Digest, Discover, Brain Pickings, and elsewhere. She received her BFA from Otis Art Institute and lives in Los Angeles.